The first time I was confronted with Lee Miller’s work was probably an unconscious encounter with pictures of the liberation of Buchenwald and Dachau. I grew up in Germany and no German education is complete without a visit to a concentration camp. This means that I must have been confronted with her gruesome concentration camp pictures very early on without even knowing that it was Lee Miller who took these photographs. When I saw the pictures of the liberation for the very first time I remember growing very cold, shivering almost, as I began to understand that these piles of things were actually human beings discarded like garbage. I couldn’t quite understand how anyone could be capable of treating human beings like that and the thought will probably remain horrifying to me until my last day on Earth. Lee Miller didn’t only see this in black and white though, she lived it in colour, she even smelled it, and instead of looking away, unable to face the horror like many of the German women who were forced to visit the camp after the liberation, she even took pictures of the experience. She photographed the smashed faces of the former guards of the camps, the liberated prisoners, the corpses, all with a horror so palpable that one can’t look at these pictures for very long. When we think of the greats of photojournalism during the Second World War, we usually remember Robert Capa’s D-Day coverage that got partly melted by a lab technician. He was not the only one covering front line fighting though and also Lee Miller stood her ground in the middle of flying bullets, for example when she was covering the siege of Saint Malo. Beautiful Lee Miller who had been a model and surrealist photographer formerly apprenticed to Man Ray was turned into a photojournalist by circumstance during that war and she was just as tough as anyone. She became attached to the 83rd Infantry Division of the US Army when the US entered the fighting and moved along with the Allied forces that advanced from Normandy down to Paris, and eventually into Germany. She photographed destroyed German cities like Heidelberg, Aachen, Cologne, Leipzig and Munich, and along the way she was also there when the concentration camps Dachau and Buchenwald were liberated. 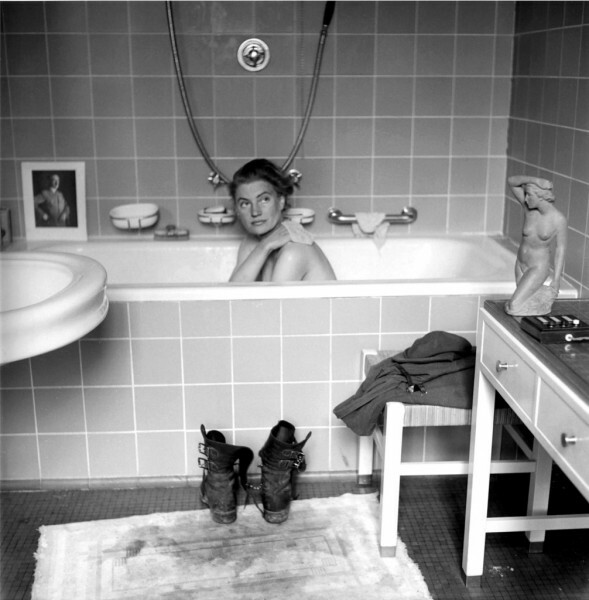 In Munich she let herself be photographed by her colleague David E. Scherman bathing naked in Hitler’s tub in his apartment. Next to the bathtub were her army boots still covered in the dirt of Dachau. Her photographs became iconic historical documents and have been the basis for the way we see this sad chapter of history, and still Lee Miller’s work seems almost forgotten now. Today I want to remember Lee Miller’s heroics and her work and tell you what I learned from engaging with her photographs and her life story. Although Miller was a woman who was familiar with living the good life – after all she had been a fashion model at the end of the 1920s and the wife of a rich man in the 30s – she wasn’t squeamish about getting dirty or ducking from bullets. Instead of returning to the safety of the US she stayed in Europe and sought out the front to do her work as a photojournalist for Vogue. Yes, women can be heroes too and don’t have to wait at home for their husbands to come back from the front. However, although she did shockingly amazing work during World War II she also paid a high price for this. After the war she suffered from clinical depression and probably from what is now known as post-traumatic stress syndrome. This went so far that she actually became an alcoholic who clearly couldn’t cope with her responsibilities as a mother nor continue her work as a photographer. Even before the war, Lee Miller had problems sustaining her own interest in her work since she had a tendency to get bored with things relatively quickly. She continued moving from one passion to another and photography stayed with her much longer than any other of her fads. Starting out as the apprentice, assistant and lover of the surrealist photographer Man Ray in Paris she quickly got into portrait and fashion work taking over assignments of Man Ray’s that he wasn’t too keen on. She also followed her surrealist interests though and developed the solarisation method together with him. Later she opened her own studio in Paris continuing her portrait and fashion work to pay for her personal projects. However, she was just as easily bored with her lovers as she was with everything else and got herself in such a relationship mess that she decided to go back to New York to escape all the drama. There she opened another studio together with her brother, which she abandoned after only a few years to get married to her first husband and move to Egypt. Obviously she had become bored also with photography since at the beginning of her marriage she didn’t want to take any pictures at all despite her new surroundings. Only after 2 years of marriage in 1934 did her interest re-appear and probably only because her life as the wife of a rich man was boring to her as well. If it hadn’t been for the war I doubt that she would have managed to sustain her interest for long and she probably wouldn’t have managed to direct it towards a purpose. Her fashion and portrait work was obviously not interesting enough to offer a purpose in itself and after the war there was even less of a chance of her getting back into this genre. At the same time her efforts to continue her journalistic work failed quite dramatically as well, since she plainly lacked focus and could only be made to work with the threat of a deadline looming. In the end she gave up photography almost entirely because she could not integrate it into her everyday life and terrorised everyone around her when one of those dreaded deadlines was approaching. Abandoning her photography obviously made Lee Miller’s work disappear from the public consciousness. She was also quite overshadowed by the success of her second husband, the surrealist painter Roland Penrose with whom she lived on a farm in Sussex. Penrose was one of the main promoters of modern art in Britain and became much more famous as an artist than his wife even when she was still working. After her last article for Vogue which included photographs taken on the Penrose farm in 1953 Lee Miller herself never again felt like promoting her own work and even pretended that it hadn’t been important at all, probably because this allowed her to get over her own failure to continue the work. She even deflected all outside efforts for the work to be promoted again. With this lack of self-esteem and her unwillingness to promote her work Lee Miller was not alone. One is especially reminded of the case of Vivian Maier who never promoted her work at all and was only discovered after her death by pure chance. Lee Miller’s work could have easily been forgotten if it hadn’t been for her son Anthony Penrose who is working so relentlessly to promote her work now. It is a perfect illustration of Miller’s lack of self-esteem though, that even her son only discovered her work after her death. Biographical accounts of Lee Miller have a tendency to end on a negative note, although she heroically pursued her work under extreme circumstances and produced an amazing body of work. Sure, she basically gave up her work to fulfil her female role, battled with alcoholism and wasn’t exactly a good mother, but since when are heroes measured by their ability to cope with everyday life once the deed is done? Well, women heroes obviously are judged like that and especially fellow females tend to feel almost offended by the fact that Lee Miller overcame her depression and alcoholism by becoming a gourmet chef. She developed a passion for something well in line with her female role as a housewife which can obviously only be an affront to feminists, especially when it’s a woman who has dodged bullets who is now doing the cooking. Often the undertone is that after the war Lee Miller failed as an artist and as a woman (both as a mother and from a Feminist perspective). Several facts are conveniently ignored when Lee Miller is summed up as someone who was defeated like this by the war though. First of all, someone who has seen the horrors of Buchenwald and Dachau, and experienced so much death and horror during one of the worst wars in human history is bound to come out scarred. Many men came out equally scarred and weren’t particularly good fathers either. That she managed to overcome her demons is actually quite amazing and too many others never even managed to regain a semblance of normality after witnessing similar horrors, let alone achieve international fame. Even more interesting is the strange reading of her becoming a gourmet chef as a fulfilment of her female role . She did not just dabble in cooking, she became internationally renowned for it and traditionally gourmet cooking is actually a men’s domain. Isn’t it actually amazing that Lee Miller managed to become famous for two very independent endeavours? Why is it that women are often judged so harshly especially by other women? Of course it is sad that Lee Miller gave up her photography and one is bound to wonder what she could have achieved if she had been more disciplined and less haunted by demons. However, one could also say that she achieved everything that she wanted to achieve with her art. She was a respected surrealist in the Paris circles, a successful portrait photographer in New York and made history with her photojournalism during WW2. Could she really have achieved more than this? Aren’t these achievement quite enough to make her one of the shining heroes of photography? Well, she definitely is a hero in my book, no matter what some people might say. Antony Penrose, The Lives of Lee Miller, London: Thames & Hudson Ltd. 1985, p.147. Karin Wieland “Ein modernes Leben. Lee Miller 1907-1977” in: Lee Miller, Der Krieg ist aus. Deutschland 1945. Berlin: Elefanten Press 1995. Jane Livingston (Ed.) Lee Miller: An exhibition of photographs 1929-1964. Los Angeles: California/International Arts Foundation 1991.